strengthening for improved blast resistance. Philosophically, the fiber-reinforced polymer (FRP) bonded to the parent structural element acts as reinforcement. Although research has been carried out to evaluate the use of pre-stressed FRP, almost all applications involve the attachment of unstressed FRP to the parent structures using epoxy. The FRP essentially acts as additional reinforcement. The major differences, as compared to traditional reinforcing bars, are (i) the strength of FRP is much higher; (ii) the behavior of most FRP is linearly elastic up to failure; (iii) the load transfer from FRP to concrete is by adhesion of epoxy as opposed to mechanical bond between bars and concrete; and (iv) the structural elements are under stress (load) when FRP is applied and these stresses and corresponding strains should be taken into account in the design. The universities, community colleges and high schools and all other educational institutions consist of a numerous blocks of structures. In some cases these institutions look like a city established within another city and have to struggle with the same type of infrastructure renovation issues as any other municipality. Our engineered Fiber Reinforced Polymer (FRP) solutions offer fast, long-lasting and economical repair alternatives to owners, architect/engineers and contractors to ensure the project is completed on time, within budget and with minimum disruption of service. Repair of corrosion damaged columns, floors, stairways, etc. in stadiums, parking garages, etc. Trenchless repair of pipelines with FRP fibers & laminates. In most cases, Afzir engineers can provide a complete “turnkey” design-build solution that includes sealed engineering drawings by our in-house engineers, all of the materials needed, and installation by one of our approved and certified installers. This unique turnkey design-build approach results in significant efficiency, time and cost-savings, and minimizes the potential errors and delays that can result when multiple groups are involved in one project. Hospitals, clinics and other healthcare facilities consist of a numerous blocks of structures. In many cases these facilities have to struggle with the same type of infrastructure renovation issues as any other municipality. Our engineered Fiber Reinforced Polymer (FRP) solutions offer fast, long-lasting and economical repair alternatives to owners, architect/engineers and contractors to ensure the project is completed on time, within budget and with minimum disruption of service. Repairs with FRP minimize dust and noise that is a major concern for the patients and staff working in a hospital. 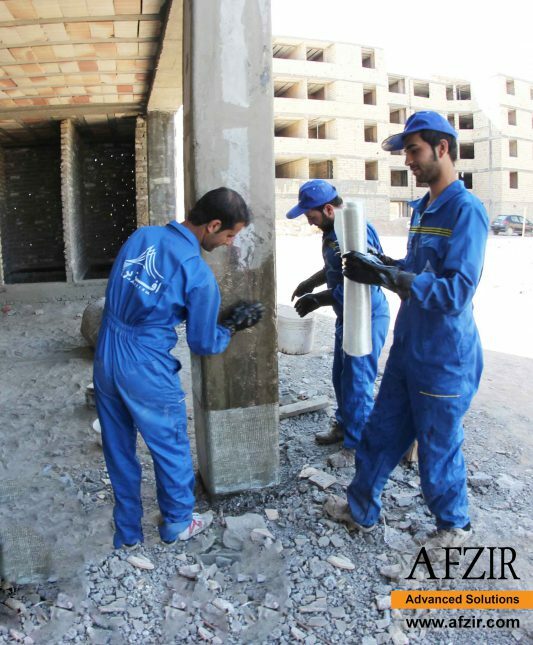 Repair of corrosion damaged columns, floors, stairways, etc. in parking garages, etc. The need for repair and restoration of historical properties such as houses of worship, palaces, government buildings, courthouses, museums, etc. that are considered to be an identity document for community, is obvious. Restoration and preservation of historic structures is vital to maintaining and promoting the heritage of any community. Many of these buildings, for example, require upgrading to current seismic standards. General aging and deterioration may be another reason for such repairs. In all cases, care must be taken not to change the historic appearance of the structure and satisfying the needs of the various historic society committees and review boards can become challenging at times. Our engineered Fiber Reinforced Polymer (FRP) solutions offer fast, long-lasting and economical repair alternatives to owners, architect/engineers and contractors to ensure the project is completed on time, within budget and with minimum disruption of service. Products such as Near Surface Mounted (NSM) carbon strips can be hidden inside grooves that are cut in walls, totally making the repairs inconspicuous. 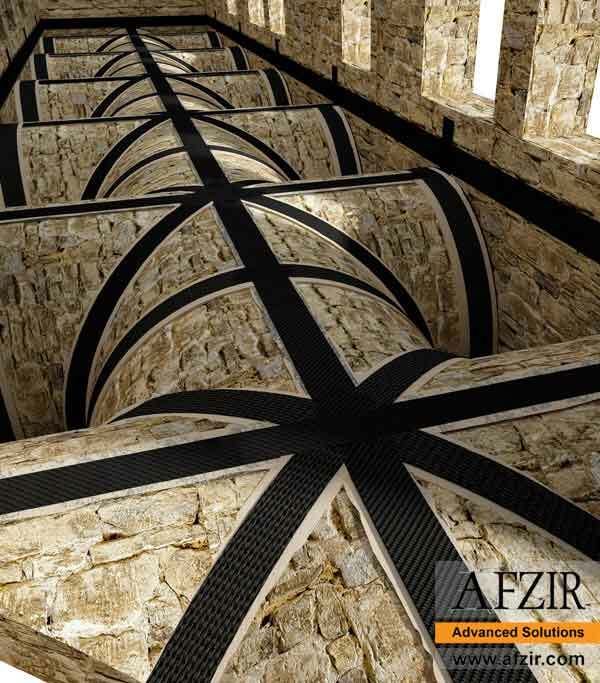 Afzir carbon fabrics that are less than 0.05 inch (1.3 mm) thick can be applied to wall surfaces and covered with various architectural coatings; these solutions are much more suitable for retrofit of historic buildings compared with the use of conventional methods that utilize large steel beams and columns or encasement in concrete. The need for parking space in parking garages (or car parks) continues to grow globally. In colder climates where deicing chemicals are used, salt-laden snow and ice accumulated under the cars gradually melts and covers the floors of parking garages. This will cause rapid corrosion of the concrete deck. In coastal regions, the salt present in air combined with a humid environment leads to fast corrosion of the entire parking facility including beams, floors, columns and walls. Our engineered Fiber Reinforced Polymer (FRP) solutions offer fast, long-lasting and economical repair alternatives to owners, architect/engineers and contractors to ensure the project is completed on time, within budget and with minimum disruption of business. 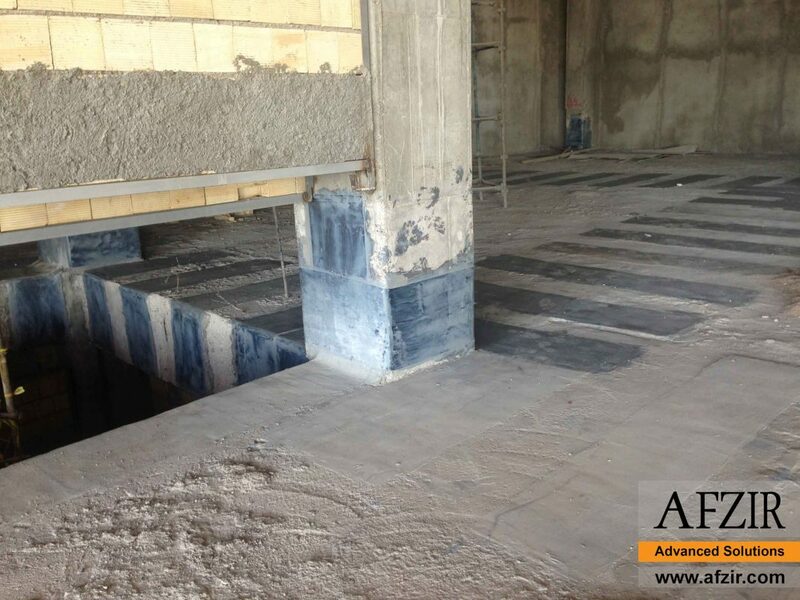 Repairs with FRP do not result in enlargement of the columns and walls. This means the same floor area and number of parking spaces remains available after the repairs for future revenue generation. Parking garages also have limited overhead clearance. 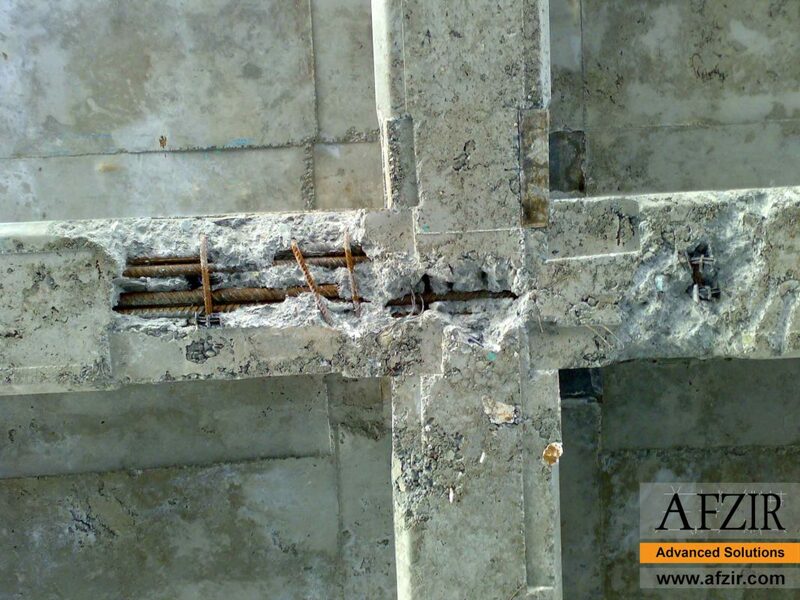 Repair of floor beams and slabs with FRP assures that the overhead clearance is not reduced due to the repairs. Strengthening of floor areas for heavier traffic loading, e.g. access for fire engines, etc. The ability to accommodate a large number of people at various recreational & entertainment occasions has made sport arenas, stadiums and gymnasiums such a unique structures. The excited fans that jump up and down to cheer and support their favorite team or band create additional vibration-induced loads on the structural elements. Partial collapse of a segment of these facilities is frequently reported in the news causing significant injuries and loss of life. At the same time, many outdoor stadiums and sport arenas are subjected to rain and snow, leading to corrosion and weakening of the structural elements. Strengthening of ceiling or overhead trusses to support hanging additional equipment such as lights, speakers, etc.